I picked up a magazine the other week called Artful Blogging. If you have not read it, you might find it very interesting. I know that I did. I think that I am going to try a few of the suggestions, such as trying to take a photo a day,and post at least a photo a week of either something I saw or something I made. It will certainly keep me busy working on my projects. I have several new ideas in my head for necklaces so I need to get busy and get them done. Of course there is never enough time in the day to get everything done. But I push on thinking that somehow I am going to get an extra 24 hours in a day. ( fat chance of that) But there you have it. 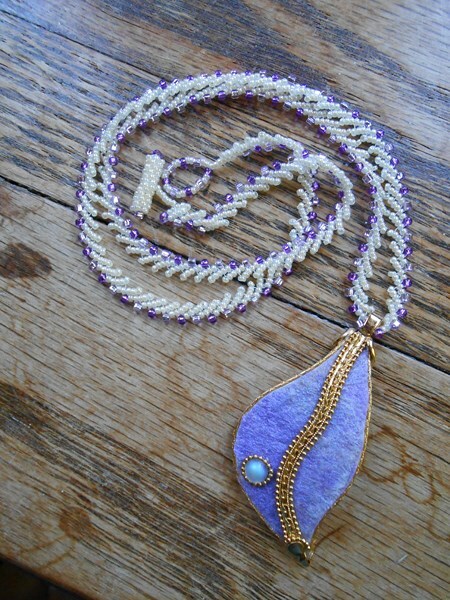 This is a necklace that I just finished. It is done is St Petersburg stitch using size 15 pearl beads and size 11 purple beads. The Pendant is made from an ostrich egg and decorated with pearlisk powders and chain. The picture does not do it justice. but my photo box is in a different state. part of many of my projects and I know that I don’t want shoddy workmanship to be my defining aspect of my project. Well, there are the thoughts for today. I am going to work on another necklace, It is one of my favorite patterns, and I have the perfect pendent for it. Then off to finish a bead picture. I have been working on it far too long, and really want to get it done.